From the people that brought us stunning fighting games like Divekick and Killer Instinct comes Extinction, a monster-battling title like no other. Coming to the Microsoft Xbox One, Extinction proves that bigger, most certainly is better. Developed by Iron Galaxy, Extinction takes cues from similarly-themed video games like Monster Hunter and the recent Shadow of the Colossus remake. By this, we mean that players need to travel across an open-world environment, battling a range of huge monsters in the process. Extinction sees players take on the role of Avil, the least of an elite ancient group of humans known as the Sentinels. As a Sentinel, the gamer must protect human settlements from vicious ogres called Ravenii. The Ravenii have been at war with humans for many years and the 150ft beasts must be hacked and slashed until they are killed. The Ravenii have fallen silent after a bitter conflict that decimated much of the world’s resources and civilisations. Upon discovering that these monstrous beasts are returning to wreak havoc once again, gamers must try to stop as much damage from occurring as possible. When it comes to button mashing, Extinction creates a much simpler combat format than some other games in the genre. By simplifying the controls, players don’t need to follow complex commands to create any sort of lasting damage on their enemies. Attacks can be cancelled, and the protagonist is able to perform all manner of movement styles, whether in battle or walking across the map. 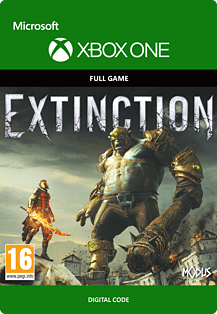 With colourful and pin-sharp graphics, Extinction is sure to be another hit in the genre and with the stunning performance capabilities of the Xbox One, you can expect a fluid and smooth gaming experience.